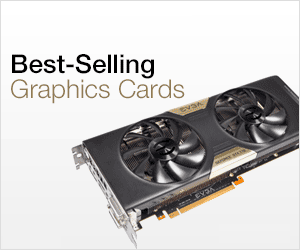 Graphics Cards are equipped with the latest and the fastest memories around. The most popular and commonly used high performance memory in budget-range, mid-range and most of the high-end graphics card is GDDR5 memory. GDDR5 has been around for quite some time and is used on many high performance graphics cards. But the time is moving forward and technology is getting more and more advanced and now we can see faster memories being developed that includes GDDR5X, HBM and HBM2 memory. Here in this post i am going to tell you about all these high performance graphics card memories and also compare them on basis of physical and technical aspects. GDDR5 is the most widely used high-speed memory that you see in the current generation graphics cards. It is the successor of GDDR3 and GDDR4 memory. Nowadays GDDR3 or DDR3 is only used in entry level graphics cards whereas GDDR4 is not even in existence anymore. GDDR5 is one of the fastest graphics card memories and is used in many graphics cards starting from budget, midrange to high-end graphics cards. Some of the latest powerful graphics cards using GDDR5 memory are GTX 1060, GTX 1070 and Radeon RX 480. Budget and mid-range graphics cards using GDDR5 memory are GT 730, GT 740, RX 460, GTX 750 Ti, GTX 1050 Ti etc. GDDR5 is a high bandwidth memory and has lower power consumption compared to its predecessors. It can reach speeds or has transfer rates to up to 8 Gbps. GDDR5 memory is manufactured by Samsung, Hynix, ELPIDA or Micron, and GDDR5 memory chips are available in sizes of 512MB, 1GB, 2GB, 4GB and 8GB. The bus-width of each GDDR5 memory chip is 32-bits wide. The so called successor of GDDR5 memory is GDDR5X memory which is even faster. GDDR5X is an upgrade or improved version of the GDDR5 memory. Both GDDR5 and GDDR5X are high bandwidth SGRAM (synchronous graphics random access memory) that are used in graphics cards, high performance servers and other advanced hardware units. GDDR5X is twice as fast as the normal GDDR5 memory and can achieve speeds in range of 10 – 14 Gbps. In future the memory speed of 16 Gbps can be made possible for GDDR5X. Currently GDDR5X memory is manufactured by Micron. GDDR5X is also consumes less power compared to GDDR5. GDDR5X memory chips are available in sizes of 4GB, 6GB, 8GB and 16GB. The most popular Graphics Cards using GDDR5X memory includes GeForce GTX 1080 and Nvidia TITAN X (Pascal). High-end Workstation Graphics Cards such as Nvidia Quadro P5000 and Quadro P6000 also uses high speed GDDR5X memory. Samsung is planning to launch GDDR6 memory in 2018 which will be the real successor of GDDR5 memory. It will have speeds up to 16 Gbps, have lower power consumption and will run at 1.35V only. Note: It must be noted that in a PCB you cannot replace GDDR5 with GDDR5X memory because both have different pins. GDDR5 uses 170 pins per chip while GDDR5X uses 190 pins per chip. GDDR6 is the upcoming GDDR memory and the successor of GDDR5 and GDDR5X. The memory will run at 1.35V and offer memory speeds up to 16Gbps (or up to 18GB/s) offering bandwidth up to 72GB/s. The memory is built on 10nm technology and will have higher density of up to 32GB per die. GDDR6 is expected to make its way in the upcoming Volta / Turing based graphics cards from Nvidia. This super fast high bandwidth memory is aim towards high-end gaming, virtual reality, cryptocurrency mining and artificial intelligence (AI). GDDR6 is being manufactured by Samsung, Micron and Hynix. Samsung and Micron GDDR6 will cater to the enthusiasts segment and will have maximum speed of 16Gbps (16GB & 32Gb dies), while Hynix will offer their GDDR6 to the mainstream segment and will have speeds of 10-12 Gbps to 12-14 Gbps with 8GB dies. GDDR6 memory is present in the Turing GPU architecture based workstation and gaming graphics cards from Nvidia that include Quadro RTX 8000, Quadro RTX 6000, Quadro RTX 5000, GeForce GTX 1660 Ti, GeForce RTX 2080 Ti, RTX 2080, RTX 2070, RTX 2060, Nvidia TITAN RTX. HBM stands for High Bandwidth Memory that is manufactured by Hynix and Samsung. It is also used in graphics cards and other advanced units. HBM memory is used in few graphics cards as of now. HBM is non-planar memory with 3D design structure in form of a cube or cuboid. In HBM multiple memory chips are stacked over one another to form a cube like structure. This makes it occupies less space on the graphics card PCB and you can even put it close to the GPU. 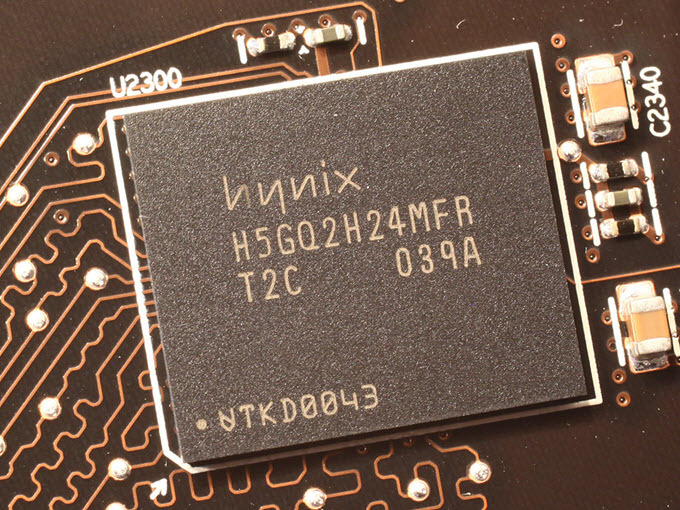 The change in the surface area also allows faster processing along the chip. HBM memory placed closed to the GPU in a graphics card PCB as shown below. Each Stack of HBM memory is independent of the other stacks but they work together. HBM is also known as compact memory or stacked memory because of its small form factor. A normal HBM memory stack consist of four 4 DRAM dies on a base die and has two 128-bit channels per DRAM die making 8 channels in total which results in 1024-bit per stack of memory interface. So a graphics card having four 4-Hi HBM stacks have memory bus width of 4 x 1024 = 4096-bits. The operating speed of HBM memory is 1 Gbps but its memory bandwidth is much higher compared to GDDR5 memory. This is because of its much wider memory bus. The memory bandwidth of HBM memory can go as high as 128 GB/s per stack. HBM can have 1 GB capacity per stack and supports 4GB per package. HBM memory uses less power compared to both GDDR5 and GDDR5X memory. The first graphics card to use HBM memory was AMD Radeon R9 Fury X. It is also used in dual GPU graphics card Radeon Pro Duo. HBM 2 is the second generation HBM memory having all HBM characteristics but with higher memory speed and bandwidth. It can have 8 DRAM dies per stack and with transfer rates up to 2 Gbps. With 1024-bit wide memory interface it can have memory bandwidth of 256 GB/s per stack which is double of normal HBM or HBM 1 memory. The total capacity of HBM2 is also more and it can have up to 8GB per stack. 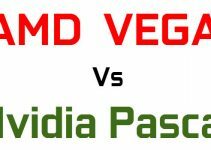 The first GPU chip to utilize HBM2 memory is Nvidia Tesla P100. Nvidia’s latest Pascal series Workstation Graphics Card Nvidia Quadro GP100 also comes with HBM2 memory. HBM2 memory will be used mainly for VR Gaming, AR Gaming and other heavy memory intensive applications. 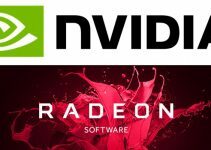 GPU architectures supported by HBM2 include Vega, Pascal and the latest Volta GPU architecture from Nvidia. 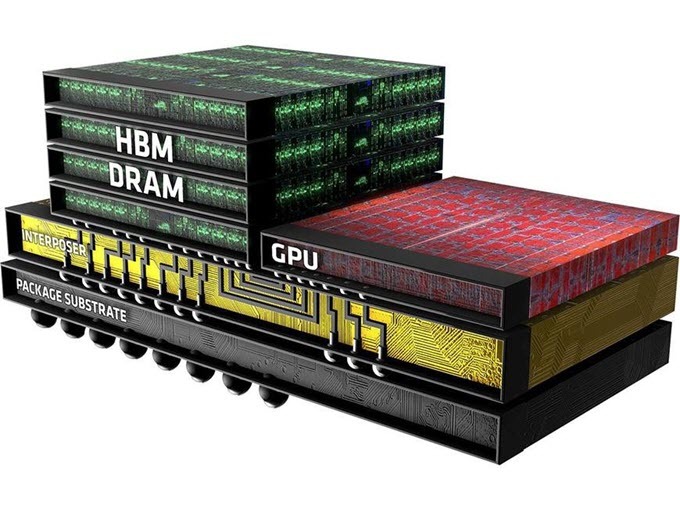 The successor of HBM2 is HBM3 which will be launched in 2019 or 2020. Some of graphics cards that uses HBM2 memory includes Nvidia Titan V, Radeon Vega Frontier Edition, Radeon RX Vega 56, Radeon Vega RX 64, Nvidia Quadro GP100. Update: The next-gen or 2nd generation HBM2 memory from Samsung is known as Aquavolt. It comes in 8GB HBM2 stacks (8-Hi height) with speed of 2.4Gbps at 1.2V. It is is much faster than the previous generation (first-gen) HBM2 memory that offered maximum speeds of 1.6Gbps @ 1.2V and 2.0Gbps @ 1.35V. This also means up to 50% additional performance over the first-gen HBM2 memory. It is also 9.6 times faster than the 8GB GDDR5 memory @8Gbps. This second generation Aquavolt HBM2 memory with 1024-bit memory bus can deliver bandwidth of around 307GB/s per 8GB stack, which is huge. You may see this 2nd gen HBM2 memory on next-generation high-end workstation graphics cards having up to 32GB memory capacity, which can offer about 1.2TB/s of enormous bandwidth. Samsung has achieved this performance with their new HBM2 memory by using new technologies in their TSV design (Through Silicon Via) and making tweaks to their thermal control. The new 8GB HBM2 single package will have 8 x 8GB HBM2 dies that vertically interconnects with over 5000 TSVs per die. Samsung has also added more thermal bumps between the HBM2 dies for better heat dissipation and it also acts as a protective layer at the bottom of the stack. Use the below mentioned formula to calculate bandwidth of any type of memory. Here is neck to neck comparison of GDDR5, GDDR5X, HBM and HBM2 memory types. At the end I would like to say that all these above mentioned memories are made for high performance and are used in high performance hardware including top graphics cards. GDDR5 is the oldest of the lot while others are relatively newer. HBM2 is certainty the best memory in terms of performance and power consumption but it is very new and is not used in any commercial graphics cards as of now. You can expect to see use of more HBM2 memory in the upcoming high-end graphics cards from Nvidia and AMD in 2018. If you have any queries or suggestions then you can connect with me by leaving a comment below. So performance wise GDDR5/X is better than HBM/2 and HBM/2 is better because of low power consumption. Right? and What about pricing? which one is cheaper? HBM2 is better and expensive. You mean between these two? 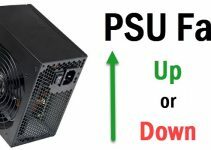 Which is better GTX 1080 or RTX 2070?. Well its too early to say but i think RTX 2070 is faster and better than GTX 1080. Ddr5x or ddr6 is the future. Amd is trying to be far to exclusive with their tech, just like nVidia is with Ray tracing and dlss nonsense. When these two companies join technology, life on earth will be in sync. I agree with you as both of them are going their own way, creating more chaos and confusion among users and also game developers. GDDR4 was shortly lived but you can still find DDR4 in some entry level graphics cards e.g. GeForce GT 1030 (DDR4 variant).